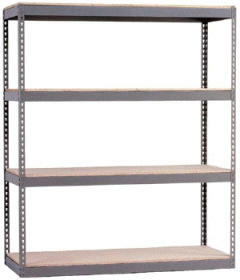 Metal Shelving is needed by most every industrial customer. 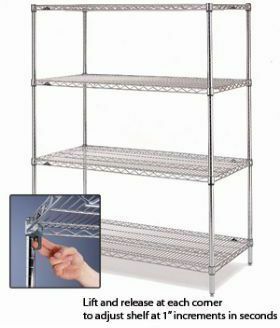 The second 2012 quarter Metal Shelving Madness promotion is to encourage even more metal shelving madness. The promotion is an all inclusive promotion including all metal shelving. As an added sweetener, the discount will also be offered to any other item ordered along with metal shelving – of equal or lesser value. A Plus Warehouse offers shelving by Hallowell, Penco, Lyons, Republic, Parent, Pucel, Stronghold, Metro, Nexel and others as well. A Plus Warehouse uses a stockyard concept nationwide to speed along deliveries. A stockyard simply keeps massive amounts of components that are put together into kits for prompt shipping. WITH a Plus’ unique stockyard concept, a metal shelving order can ship on a next day basis. When thinking about shelving, A Plus Warehouse suggests you consider starters and adders. A starter shelving unit has a full set of posts, braces and shelves. An adder lacks two posts and one set of side braces. The missing parts for the adder are shared with the prior unit the adder is being added to. By ordering less metal in the metal shelving order, the result is a lower total price, with no drop in function. Additionally, customers should realize that closed units can be made more economical by sharing enclosure panels. For example, two units with backs aligned back to back can share the same back panel. A Plus Warehouse salespeople can take your sketch and create an economical metal shelving solution. When ordering shelving from A Plus Warehouse, please also consider rolling ladders. A Plus Warehouse also provides these items, and most shelving users have to access top shelves somehow – why not with an A Plus Warehouse rolling ladder? A Plus Warehouse is a national business to business distributor providing customers materials handling and storage equipment. Contact A Plus Warehouse at 800-209-8798 in US and Canada. A Plus Warehouse has been Servicing customers Coast to Coast since 1996. 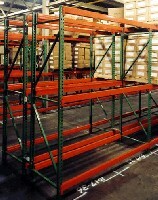 Rivet Shelving Hallowell Dura Shelf - Pass Through shelving Metro Wire Shelving Pallet Racks - Ready to Ship Best Prices!